I went with a friend to the Midpoint Music Festival on Thursday, buying a three day pass for $49. You can buy a ticket to any stage, but the three day pass is by far the most convenient and economical way to listen to a lot of music. My friend had heard of a guitarist Kaki King, so we headed over to SCPA to check her out. Kaki King played instrumental guitar, but it was not like any guitar I’ve ever heard or seen. She was absolutely amazing. You can see her technique in this YouTube video of one of the songs she played last night. Due to population decreases, Ohio has lost two seats in the House of Representatives forcing changes in Ohio’s districts. 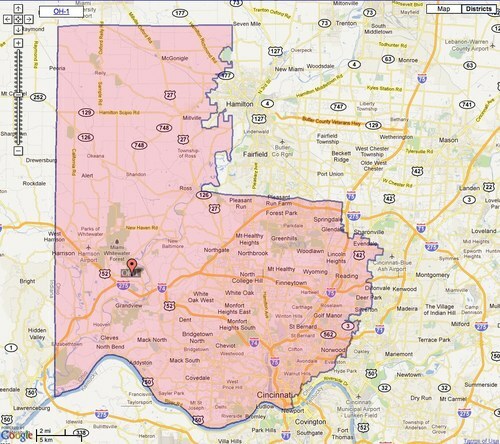 Ohio’s state government, dominated by the Republicans have gerrymandered the districts to strongly favor Republicans. Here’s the old District 1, Steve Chabot’s district. It seems reasonable geographically, covering Southwestern Ohio. 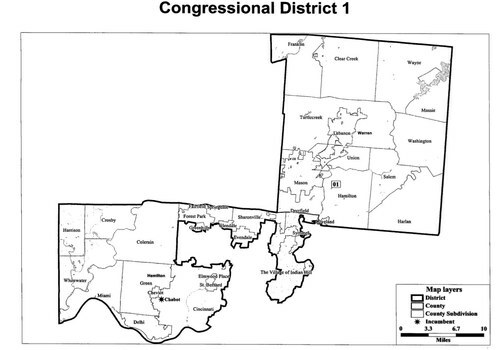 Here’s the new District 1 that was passed by Ohio’s congress yesterday. The new district is a convoluted mess which makes no sense geographically. But politically, by adding suburban areas of largely white voters and subtracting predominantly black neighborhoods by pushing them into District 2, the Republicans have neutralized the urban and black vote that leans more Democrat in District 1. Just looking at race, on this mashup map that I created of a population map by race of Cincinnati from 2010 census data and the new district, you can see that the Republicans have divided the black population into District 1 and District 2. By doing this, the Republicans have created a mishmash district with mismatched groups of urban and suburban voters. How is a representative to effectively serve this disparate group? Effective governing doesn’t seem to matter to Republicans, just keeping the power of the Congressional seats. Cincinnati as the largest population center in the region should have a representative advocating the needs of the urban core and inner ring suburbs. Photos of hood ornaments and some front grilles of classic cars at the Concours d’Elegance show on Sunday. 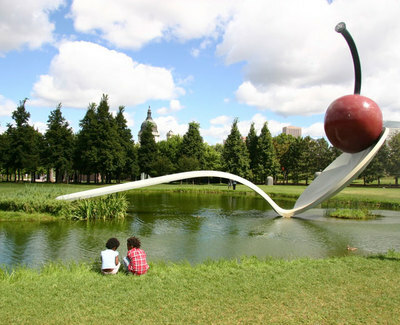 Beautiful art in chrome! Mark Mallory in disguise pretty much looks like Mark Mallory. It’s his distinctive faces and glasses. Occasionally he’d slip and speak to clearly. City Workers are definitely under-appreciated for the work they do. 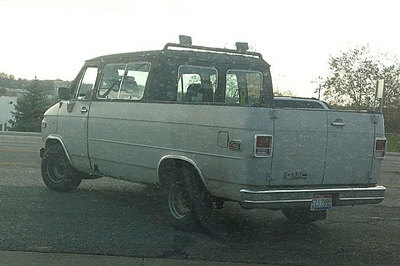 Who knew that there was only ONE person that picks up all the dead animals in the city. The Undercover Boss ending where the boss helps his employees doesn’t quite feel right for public employees. It just seemed a little off when the Mayor is giving gifts donated by corporations to the specific employees. Mark Mallory is an excellent spokesperson for the city. You can tell his love and passion for the city and its people. Overall, it was entertaining and a good thing for the nation to see a mayor who cares about the city and its employees. You can watch the episode at CBS.com. From the Cincinnati Reds Twitter. I love this! If you notice the right arm is on a spring and attached to the head so you can duplicate Johnny Gomes’ twitchy helmet routine when he stands to bat. 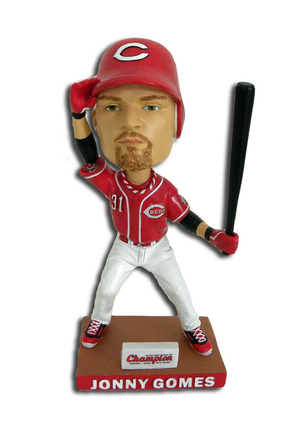 Jonny Gomes bobblehead day is July 23 vs. ATL. The season didn’t end like the way we would have liked, but it was fun to be excited about the Reds in October. 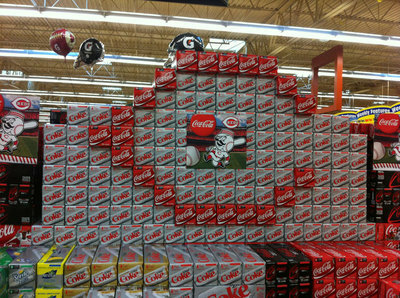 Photo: Reds Coke display at Kroger.